In 2006, Al Gore’s An Inconvenient Truth spread the idea of human-caused climate change far and wide in what is now considered a watershed moment for the science. But today, on the ten-year anniversary of the film’s release, we’ve made little progress toward addressing the grave planetary concerns Gore raised. In fact, by practically every metric, things have gotten much worse. Over the past decade, humanity’s climate-warming carbon emissions have risen steadily, from 8.3 billion tons in 2006 to roughly 10 billion tons last year. The concentration of CO2 in our atmosphere has grown in step, briefly topping the historic 400 parts per million (ppm) milestone for the first time in 2013. Then, last spring, atmospheric CO2 rose to 400 ppm for an entire month. Now we are on the verge of living in a world where 400 ppm or greater is the permanent state of our atmosphere, something that hasn’t happened in millions of years. Top: Estimated global anthropogenic carbon emissions, via Boden, TA, Marland, G and Andres, RJ 2013. Global, Regional, and National Fossil-Fuel CO2 Emissions, Carbon Dioxide Information Analysis Center. Bottom: Mean annual atmospheric carbon dioxide concentration, via NOAA. Graphic by Maddie Stone. The consequences for our climate have been stark. 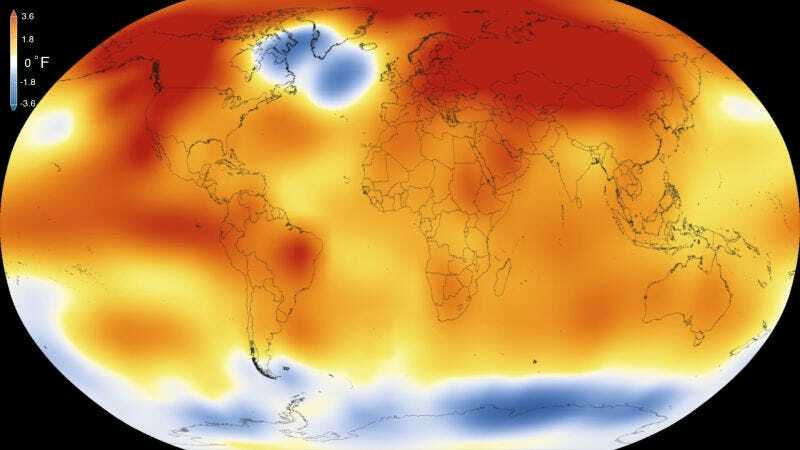 The year of An Inconvenient Truth’s release was the hottest in recorded history, but just four years later, it was overtaken by 2010. 2010 held the heat record for three years, before 2014 came along and took the crown handily, only to have its record shattered by 2015. Now, a mere five months in, scientists are already calling 2016 the hottest year yet. And it’s not just annual records that are being broken like New Year’s resolutions: every month for the last 12 has marked a heat record, too. Over the past decade, a wealth of scientific studies and reports have laid out the likely consequences of human-caused global warming. Rapid polar ice sheet melting. Sea level rise. More extreme storms, droughts, heat waves, and fires. Ocean acidification. A mass die-off of Earth’s coral reefs. A sixth mass extinction. If any of these sound familiar, it’s because all of them have become our reality, with increasingly devastating outcomes for human society. The future predicted by science and broadcast by the likes of Gore is already here. If there’s a silver lining, it’s that the specter of climate change is now impossible to ignore for all but the die-hard science deniers. And politicians are starting to take action. Last month, leaders of 175 countries met to sign the Paris Climate Agreement, which resolves to limit global warming to 2 degrees Celsius, a ceiling that will hopefully allow us to avoid the most catastrophic impacts of climate change. But the actual pledges contained in the Paris Agreement don’t get us anywhere close to where we need to be to prevent oblivion. Since the beginning of the Industrial Revolution, we’ve emitted approximately 2,000 billion tons of heat-trapping carbon dioxide into the atmosphere. According to the Intergovernmental Panel on Climate Change, if we want to preserve a better-than-50-percent chance of limiting warming to 2 degrees Celsius, we can only emit another 1,000 billion tons of CO2 at most. If everybody sticks to the carbon reductions pledges outlined in the Paris Agreement—and that’s a big ‘if’—we’ll use up that budget by 2040. Without more aggressive decarbonization, we could be in store for closer to 3 degrees of warming by the end of the 21st century, making it far more likely that global sea levels will rise several feet, drowning coastal cities worldwide and displacing tens of millions of people. Yes, climate science has advanced greatly since An Inconvenient Truth, and yes, Al Gore’s once-extreme ideology has gained some mainstream acceptance. But the truth of the matter—that we need to do much, much more to stop human-caused climate change from permanently altering life on Earth—is as inconvenient as ever.